AMD is not only launching extreme super fast and expensive processors right now, it also dropped us its brand new Kuma dual core: the Athlon X2 7850 Black Edition. It's 100MHz faster than the Athlon X2 7750 Black Edition we reviewed and overclocked late last year! So, we've got a minor speed bump, but has anything else changed? If you're unfamiliar with the world of AMD - then you might want to pay attention because these inexpensive K10-based 65nm dual cores are unlocked to enable easier overclocking, and in some respects they are quite competitive to the budget overclockers' favourite: the Intel Pentium Dual Core E5200. At £62 the 7850 Black Edition is £10 more than the Intel E5200, but does a small clock increase do much to change the outcome? Or is it different inside? Checking CPU-Z we see that it uses the same B3 core that the original, TLB fixed Phenom X4 9x50s used - and while the software claims reads the core ID string as a different CPU, under the metal heatspreader it's really just the same quad core silicon with two cores disabled in hardware. The HyperTransport clock is 1.8GHz - faster than the older 1.0GHz K8-based Athlon X2s, but respectively slower than the 2.0GHz that the Phenom II Black Editions are now shipping at. The same goes for the integrated memory controller and L3 cache clock too - stuck at 1.8GHz this is a bit lower than its bigger brothers, but at least the large 2MB L3 cache and faster, native DDR2 1,066MHz memory support helps offset this "slower" memory core compared to the K8 Athlon X2s. In addition, just like all the K10 CPUs to date, these have two memory controllers that can either work together in one 128-bit dual channel memory controller, which is better for single threaded scenarios, or work independently as two, single channel 64-bit channels, which is better for multi-threaded and general multi-tasking productivity. Since this is yet another Black Edition product, we've endeavoured to see how well it overclocks, especially when you consider the somewhat limited experience we had during our previous Athlon X2 7750 Black Edition testing. Unfortunately, the limitations of the AMD 65nm process again made themselves known and despite the fact we edged up to 3.3GHz, the system was not stable until we dropped down to 3.1GHz. Likewise, we found a general resistance to HTT overclocking at all and the integrated memory controller overclock only allowed 2GHz stable, but would boot at 2.2GHz. Too much CPU voltage on the Biostar board would cause the system to endlessly blue-screen and reset itself, so we managed to feather a balance at 1.4125V at only 3.1GHz stable. For the same overclock, the 7850 Black Edition isn't worth it over the 7750BE. The CPUs were not overheating, sitting sub 40ºC under an OCZ Vendetta 2 heatsink, and we tried both sets of memory slots to check if it made a difference. It didn't. Basically, until AMD squeezes out some 45nm dual cores, or you don't care to overclock it, the 65nm Kumas have limited overclocking headroom. One of AMD's cheapest quad cores to date is a further evolution of the Athlon brand: the Athlon II X4 630 and 620. Without cache we check to see how it performs against Intel alternatives for the same money, if cache makes a difference and if it overclocks better. The Athlon brand lives on! AMD's latest CPU is a 45nm, 3.0GHz exceptionally budget friendly processor, ready for DDR3 as well as DDR2. Is it a monster overclocker and all round Intel E5200 killer? 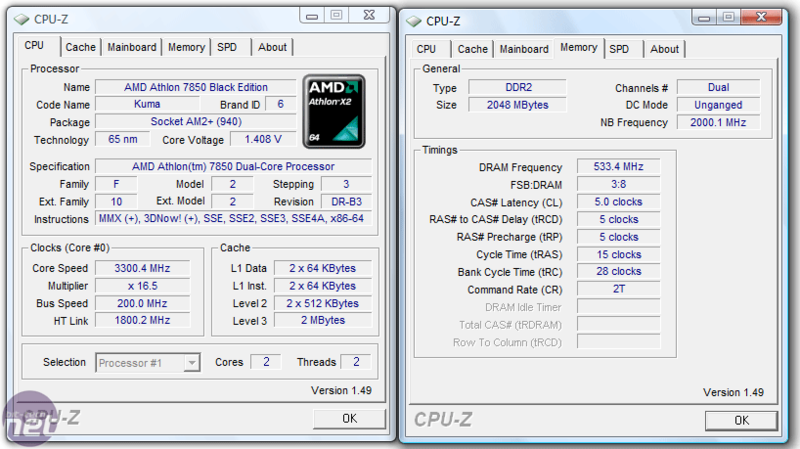 A CPU-Z screenshot showing AMD's Athlon II CPU emerges, suggesting that the new "Rana" core will have no Level 3 cache.